last-last minute inspiration always gets me! 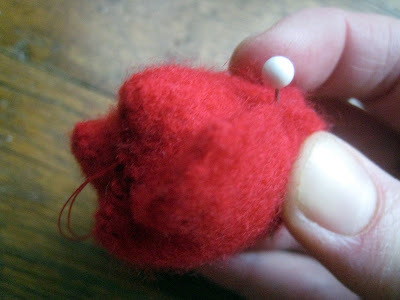 as i was staring down another red sweater for heart-making, the image of this sweet pomander by betz white popped into my head. lo and behold, i had to make roses. now, i've never told you this before, but i may have hinted at it. i have this little story from second grade art class lodged deep in my psyche... we were making construction paper monsters or some such thing, and i had the stunningly brilliant idea to make three dimensional accordion-style arms that sprung from the page. this girl who sat at my table copied my design, and the art teacher chose her work for the 'special' bulletin board. i was so upset. plagiary! she stole my idea! and was rewarded! and since that time, well, copying has been a touchy subject for me. over at make + meaning, some brilliant discussions have been going on about art and the concept of free. 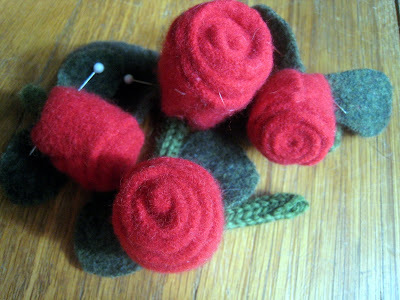 so i'm going to swallow up my copy-cat-itis, and share my design for these little rose corsages. afterall, i think it was the image of betz's work that inspired me. let the love flow. 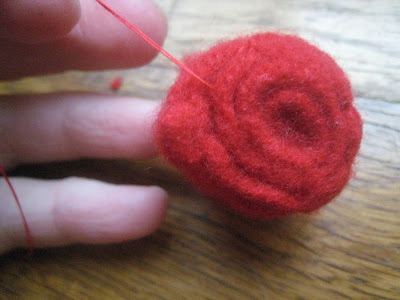 1. cut a strip of felted wool (as wide as you wish your rose to be tall). and better too long than too short! 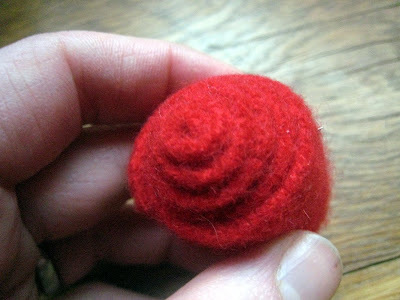 2. roll it up into a beautiful looking rosette, trim any excess (it gets more difficult to sew the more layers there are). 3. after deciding on the top and bottom, take some double stranded thread (with a knot in the end) and pull it through the middle. 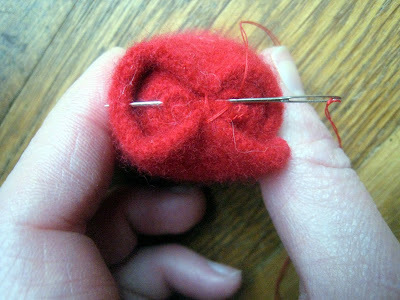 a trick to cinching it up here is to put it through the center layers first, then go back and get the outer layers. 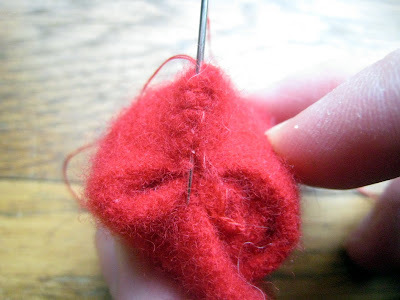 go through your knotted end to secure it, and do it a couple times until it is well-cinched. 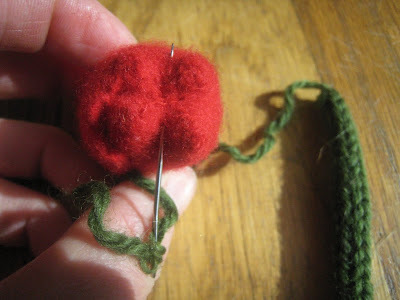 4. you'll be cinching again on each half, right down the middle to make a 'cloverleaf' shape. 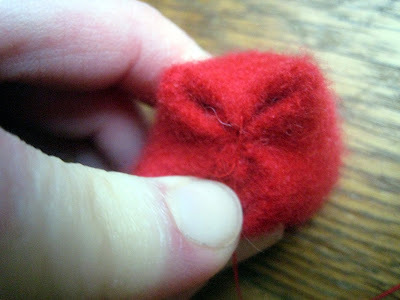 this time i did one side plus sewed up the 'leaves' before doing the other, but you can also make the cloverleaf all at once before you sew up the little 'leaves'. 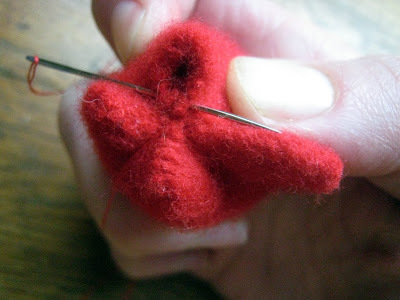 5. sew up each leaf with a little whipstitch (through both sides, over the top, and through again), bringing the thread and needle back to center after each one. cinching the other side to the middle to make the 'leaves'. 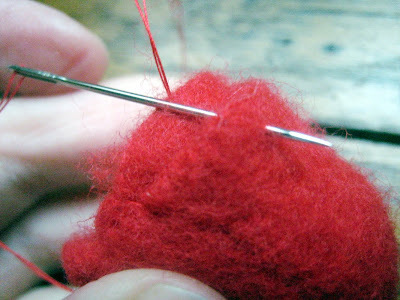 6. now you're ready to sew up that loose end of wool. 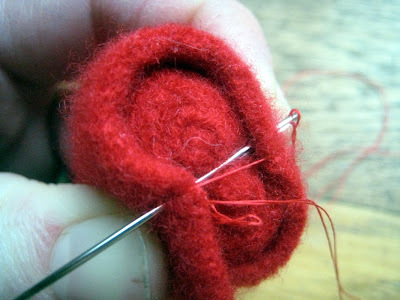 pull it very tightly around and pin it exactly where you want it on your rose. you might find the wool needs some more trimming here at the side or top. 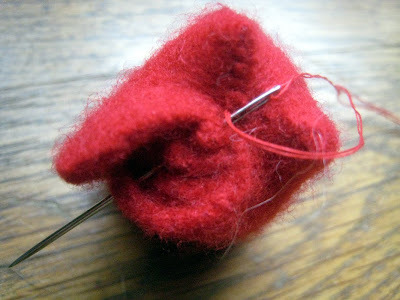 7. whip stitch up the side (aka the 'loose end'). 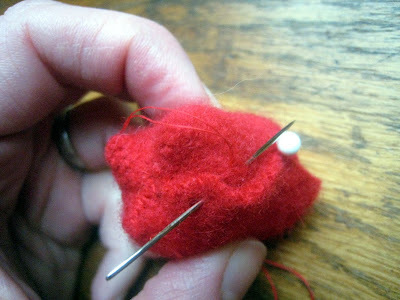 9. pull the thread through to an unobtrusive spot and knot it. (i like knots. it makes me feel secure.) then run it through some more layers before trimming it, so no loose ends are flying. look the sun came out for my pictures now! 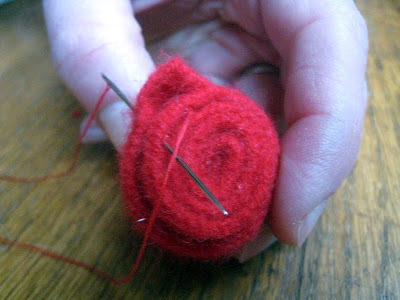 10. using some knitted i-cord, take the loose end of the yarn to sew a 2-3 inch length of i-cord onto the center bottom of the rose. 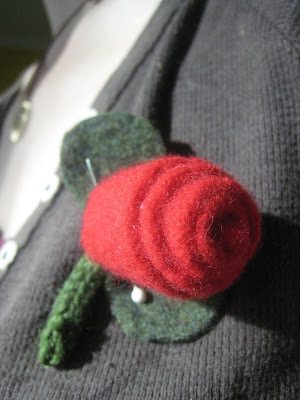 (i used an embellish-knit for i-cord, but you can also knit some up). 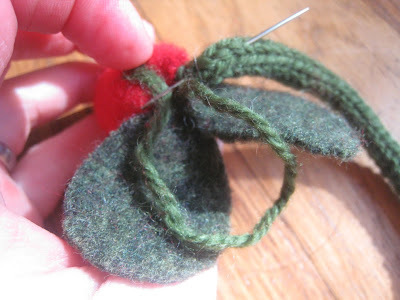 11. then attach felted green leaves cut from another wool sweater. 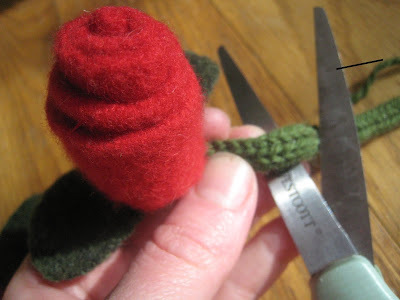 here you see my yarn coming out through the rose, going into the leaf, and it will come back down through the very tip of the leaf and go through the rose/cord, and to the other side for another leaf). not too technical, just get 'em on there! 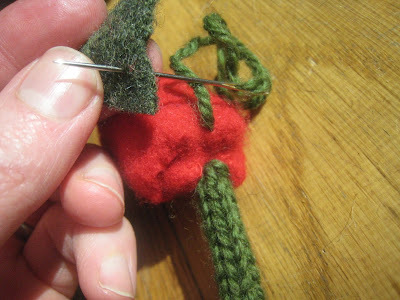 12. again, when done, sew a little knot in your yarn, then run that yarn down the cord and trim it! 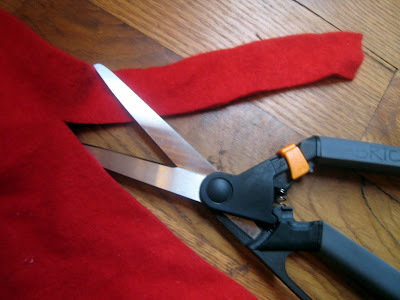 since i had a long bit of cord made up, i also needed to cut and knot up the end too! 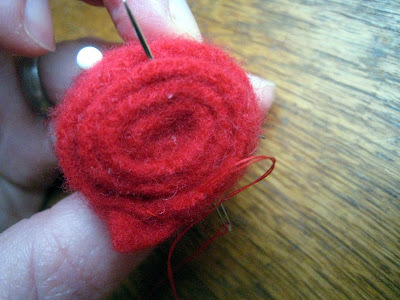 edited to add: 2/19, just found this awesome tutorial on the purl bee for very similar, and very beautiful, rose barrettes. it's well laid out too!